Setting up a proper crabitat can be expensive even with a 10 gallon tank and the bigger the tank the bigger the price tag for stocking it. With some planning and creativity you can upgrade to a large crabitat without going broke. This article is about ways to save money when setting up as well as some common mistakes to avoid. The first thing I can’t stress to people enough is that there are places you can shop that are far cheaper than a pet store!! A new 150 gallon tank will cost you hundreds of dollars. 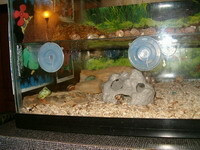 I bought my 150 gallon tank out of the newspaper for $60.00. There are places where you absolutely should not cut corners. Gauges – A high quality, accurate hygrometer will run you about $25.00 on most cigar websites. Cheaper gauges will stop working and have to be replaced frequently. In the long run it’s less expensive to buy a quality hygrometer. There are some wireless weather station gauges that are also great for your crabitat. Just don’t place them directly on the substrate. If you have more than one tank you can buy a base station that connections to units you place in the tanks wirelessly. Lid – use glass or plexiglass. Plexiglass or Lexan is available at home improvement stores. It’s inexpensive and they will cut it to size for you, for free. So measure your tank opening before you go. You can also order pre cut pieces online. Light fixture- you need day and night bulbs and combo hoods are perfect for this. You can get a bi-light or even a tri-light hood. You can get hoods that take a variety of bulb styles. Invest in a couple timers to control the lights and they become hassle free. If you use a light hood with higher wattage bulbs you won’t been another heating source. Substrate is the least expensive. Playsand is the perfect substrate and is less than $5 for 25lbs. Eco earth or coir fiber can be purchased online in bales at very reasonable prices if you choose to mix in a small amount. A simple layer of Growstone or Hydroballs can be used to make a natural drainage layer if you have concerns about flooding. This should not happen if you do not start with overly wet substrate and don’t allow your humidity to stay above 90%. In 14 years of keeping hermit crabs I’ve never had a tank flood. Bowls or pools don’t have to be expensive reptile dishes. You can use nearly any sort of glass or ceramic people dish that is the right shape and size. You can use empty scallop shells as food dishes or the clay trays for flower pots. A soap dish from the dollar store or clearance aisle works as a food dish. For pools you can use plastic paint trays or Tupperware dishes. To make them safe for all size crabs you can use aquarium sealant and glue river rocks or other items to the inner walls. 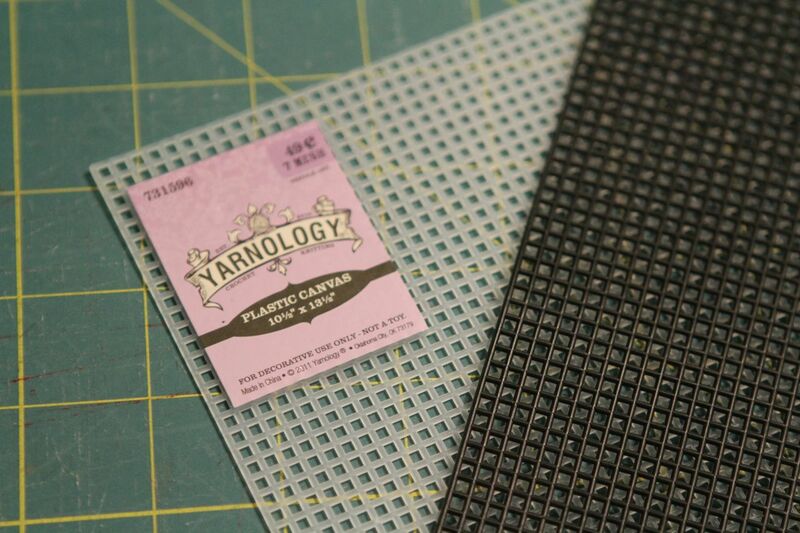 You can also use plastic gutter guard to make a ramp or the plastic grids sold for doing craft projects. You can get really creative with your decorations. If you pick up stones or driftwood be sure to check for insects and bake or boil first to sterilize. Buy your vines and plants at a craft store. Flowerpots, bowls and cups all make good ‘caves’. PVC pipe has been deemed unsafe and I can no longer recommend its use. You can convert Tupperware bowls into Humid Hides very easily. Natural fiber baskets provide a place to hide and something to climb on but check them regularly for mildew if your substrate is very damp. Use things like zip ties and suction cups to anchor decorations. A glass fish bowl turned on it’s side makes a really cool humid hide when you add some moss. Second or third levels are a great way to maximize the use of the space in your larger tank. There are so many different ideas out there for creating usable space out of thin air! A couple items to consider: plexi glass, plastic gutter guard, netting (fish or hemp) plastic canvas grids (like for latchhook rugs), plastic coated mesh wire and wooden dowels. 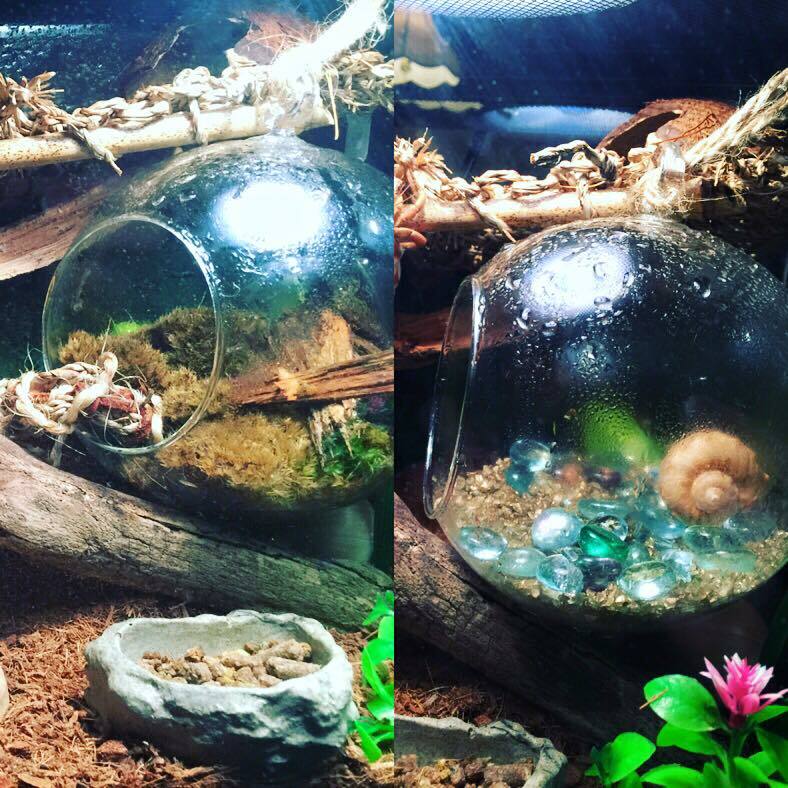 Skip the expensive backgrounds sold at the petstores and instead use a very clever idea submitted by one hermit crab owner: shower curtains! Vinyl shower curtains come in an array of designs and can be found dirt cheap at close out stores or dollar stores. Simply cut it to fit and affix to the outside of your tank. Soaking or washing first to remove the odor is recommended. If you are talented enough, consider painting a mural on the exterior of your tank. Use non toxic paints! Will some items be too hard to clean around? Should items be permanently affixed? How heavy is the sand? How far do I have to carry it? Can I easily reach the food and water dishes? How much does substrate cost and how much will I need? Take into consideration how your design will impact your crabitat cleaning. Clean and sanitize anything you put in your tank. Shop online first. Light bulbs and fixtures are traditionally less expensive online. But a non adhesive heat pad. The adhesive goes bad really fast and the mats warp. Non adhesive can be mounted with tape and easily insulated. Keep metal away from food and water dishes. Watch for rust-remove anything that shows signs of rusting. 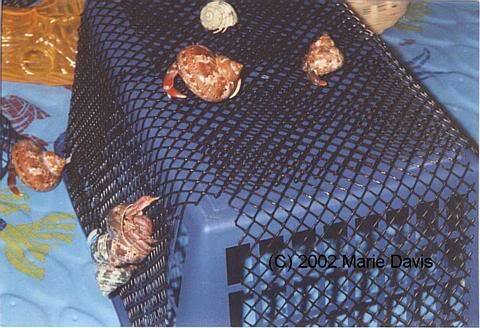 Check wire coating to make sure the crabs aren’t eating it –remove if they are. Avoid putting any sort of paint in the tank. It peels and the crabs will eat it. Avoid items that will easily mold or mildew. Don’t make the second level too high or your crabs will escape. 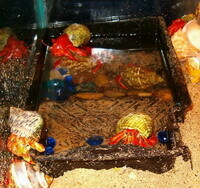 Don’t think for a second that your crabs will respect how feng shui their crabitat is and NOT completely destroy it.